This is minimal change disease (MCD) which is characterized by effacement of the epithelial cell (podocyte) foot processes and loss of the normal charge barrier such that albumin selectively leaks out and proteinuria ensues. By light microscopy, the glomerulus is normal with MCD. 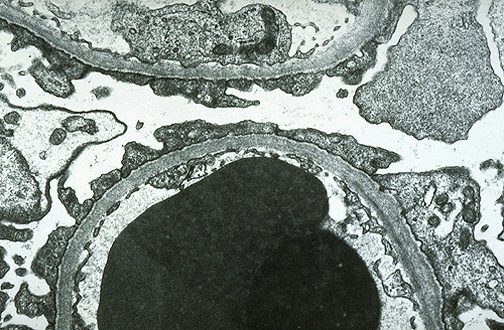 In this electron micrograph, the capillary loop in the lower half contains two electron dense RBC's. Fenestrated endothelium is present, and the basement membrane is normal. However, overlying epithelial cell foot processes are effaced (giving the appearance of fusion) and run together. Characteristic urinalysis findings are shown below.